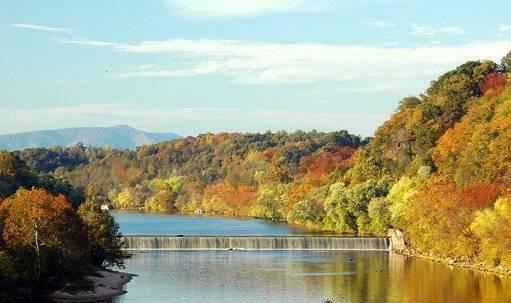 Foliage.org: What are the projected dates for Lynchburg, Virginia peak foliage season? Are there areas, vistas, scenic lookouts or other destinations within Lynchburg, Virginia that are known for their uniquely beautiful fall foliage displays? Old City Cemetery and its walking trails, gardens and Civil War Sections are breathtaking in the Fall. The James River offers exceptional color as it meanders through Lynchburg, and a day drive itinerary called “75 miles of Splendor” begins and ends in Lynchburg taking in the National D-Day Memorial alive with color , Thomas Jefferson’s retreat home Poplar Forest and 28 miles of America’s most popular scenic drive; the Blue Ridge Parkway. Rt 460 West from Lynchburg towards the Blue Ridge Mountains offers beautiful views. Routes 501 and 130 from Lynchburg to the Blue Ridge Parkway are unforgettable, rural country drives in the autumn of the year. Old City Cemetery and the National D-day Memorial as these sites are completely unique and also offer some of the most spectacular color available in Virginia! 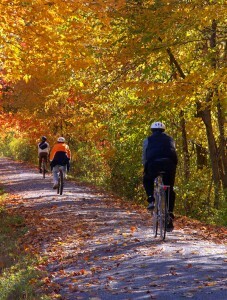 What are some other popular tourist attractions for autumn travelers to Lynchburg, Virginia. What are some of the less well known, but much loved local attractions? Popular: The National D-Day Memorial, Appomattox Court House National Historical Park, Patrick Henry’s Red Hill estate, Thomas Jefferson’s Poplar Forest, Natural Bridge, Smith Mountain Lake. Lesser Known, incredible sites: Lynchburg’s own Old City Cemetery, Diamond Hill historic District, Historic Sandusky & Civil War Center, the Lynchburg Museum and Point of Honor and Blackwater Creek Trail. Families coming to our area love to take in the Blue Ridge Parkway loop (75 miles of Splendor), or drive most anywhere on the Parkway, Appomattox Court House NHP, the National D-day Memorial, Smith Mountain Lake, Amazement Square in downtown Lynchburg and Blackwater Creek Trail all offer wonderful opportunities to spend family time and build lasting memories. Is there anything else you would like to tell visitors thinking about traveling Lynchburg, Virginia for the fall foliage season? Because of its location, within 20 to 30 minutes of countless world-renowned sites, attractions and recreation, Lynchburg is the perfect spot to nestle down a few days and see all Central Virginia has to offer….especially in the Fall!